Review: "Agonist, The: Eye of Providence" - Sea of Tranquility - The Web Destination for Progressive Music! When original vocalist Alissa White-Gluz left to join Arch Enemy last year, The Agonist didn't waste much time finding her replacement, Vicky Psarakis, who makes her debut here on Eye of Providence. Ultimately, not too much has changed with their formula, as Psarakis proves to be a more than capable shoe filler, unleashing fiery growls, screams, and soaring clean vocals throughout the 13 tracks on this latest release. Arguably, she might even be able to take this band further than they've ever been. 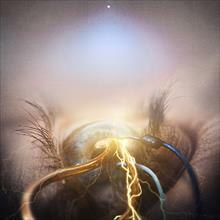 While the music of The Agonist has never set the world on fire with originality, their take on modern & melodic extreme metal is certainly not without its merits. Twin guitars spew out a wide assortment of riffs & solos, the rhythms chug along, and the songs are heavy yet highly melodic. "Danse Macabre" is one of the more successful tracks, with dueling female & male vocals (Psarakis really shines here on the clean vocals), and passages of "Perpetual Notion" are actually quite breathtaking. For those who like the more brutal side to the band, look no further than the melodic death metal tunes "A Necessary Evil" and "Gates of Horn and Ivory", but the reality is that the mellower tracks clearly outshine the heavier numbers, thanks in part to Psarakis' gorgeous vocals. Just listen to her soar on the poignant "A Gentle Disease" and the lush "As Above So Below"...wonderful stuff. Eye of Providence has a few potential breakout tracks that are highlighted by some terrific vocals and catchy arrangements. For my money, I'd be happy to see this band drop their extreme nature and fully embrace their melodic side, as they just seem more successful writing material in that direction. Long time fans might not agree with that opinion, but give a listen to the softer stuff here and you just might change your mind.